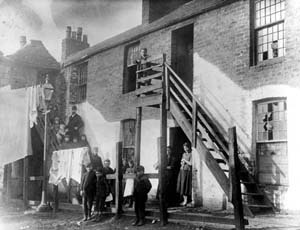 Beefcan Close, which was off William Lane, between Victoria Road and King Street, was said to once have been a very poor area. So destitute were the inhabitants, the story goes, that they were forced to pawn their cooking utensils. But, having to find something to eat from, they went to the local grocers and asked for the empty cans that had contained salted or processed meat and used them as pots and pans – and the close took its name from that. High Jinks in the Beef Can Close… but where was it? Off the top of one’s head the answer seems simple – the Overgate. And, indeed, much evidence points that way, since readers of yesteryear are willing to supply details. It was between a shoe shop and a butcher’s shop, is the usual answer. Other folk go into more detail. It was, they assert, between Birrell’s and Alex Munro’s, and the name came from the traffic of stock up the close into the back door of the butchers. And so the matter rests – at least with the Overgate school. But there is another faction who claim a different locale. There is much support for it having been between Victoria Road and King Street, off William Lane. William Lane, or “Little Weelumie” as it was called, ran parallel to Dens Brae, and at its northern end, where it joined Victoria Road was a flight of steps. Not far from the end of these steps, and on the left as you descended towards King Street was another, shorter, flight of seven or so steps, which took you into the famous close. This point of view is even supported in verse. A song of the day “The Ballad of the Beef Can Close”, is quite specific. The ballad tells of a ploughman lad on the lookout for high jinks in old Dundee. He falls in with a good-time girl called Jemima Ross, and awakes the next morning lying in the street “at the bottom o’ the Beef Can Close” – which goes to show that being mugged and rolled is by no means purely a present-day phenomenon. But rural cannieness triumphs over the city slickers as the loon had the foresight to hide his money in the tail o’ his sark. What is significant in the song is that Jemima Rose tells him she lodges “wi' a wifie in Todburn Lane, at the bottom o’ the Beef Can Close.” (Todburn Lane, incidentally, ran behind King Street and crossed William Lane near its King Street end, so it would be “at the bottom o’ the Beef Can Close”). The official view on the disputed location comes from Mr James D. Boyd, Chief Officer of the city’s Museums and Art Galleries. The Beef Can Close was at 1 North George Street, he says – a view supported by a reader (unfortunately anonymous) who identified the photograph when it was published in 1960. So where was the famous close? Overgate, North George Street or off William Lane? Following our recent article on Dundee’s famous Beef Can Close, readers got in touch to add their own memories. Mrs Margaret Russell of Baltic Gardens says, “I’m going back 75 years, when I lived in the Overgate and my granny lived there”. “It was between Birrells Boot Shop and Munro the Butchers”. "There was a shed in the close to store beef. We played there and had to let the beef in”. Further fuel is added to the controversy by Mr Fred Worsley of Glenesk Avenue, who phoned to offer yet another possible location. He suggested the close was in the Overgate, but on the other side, near the Mercat Cross Bar. The bar, he says, was at one time a flesher’s – a butcher in modern terms – and he places the close in the backlands nearby. This would mean it was on the south side of the Overgate near its intersection with Lindsay Street, in other words opposite and farther up from its usually fancied position. So, the location still seems to remain a rich source for debate. Possibly the answer is that more than one locality in Dundee bore the name, being given it by residents or visitors because of a resemblance, real or fancied, to the original. But then of course another question arises – if that was the case, which site was the original, or “real” one? Sadly, the answer has probably passed irretrievably into history.